We’re celebrating sales people this week at OpenSesame! Our sales team is so critical to what we do, and we truly appreciate their efforts. Awesome sales rockstars like ours have to start somewhere…that’s why we’re featuring sales courses this week. 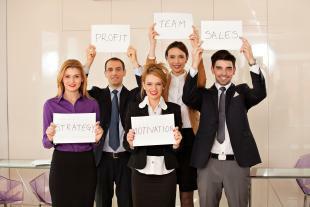 Training can make a huge difference for anyone on your team, sales people included! Guide your reps to develop a strong sales execution and process to aid in pinpointing key factors that can lead to success in closing a sale. This comprehensive sales bundle is ideal for both beginner and experienced sales professionals; get it for the special price of $25 (originally $40) this week, and build a strong foundation for your sales team! While we’ve all taken subjects like math, science, and language arts, few of us have formally learned how to work with others and make successful connections, both of which are essential for professional success. Help your employees become the best they can be with this (highly) entertaining course! Interested in business analysis or training your team? Don’t miss this BCS Accredited Commercial Awareness course! Start the journey to certification and become more confident in financial reporting, evaluating a financial case, and understanding budgeting, costing, and pricing. Get ready to take (and pass!) the BCS Commerical Awareness Exam. Drive organizational progress and business growth in your company to get the competitive advantage you need in today’s complex market by developing your Organizational Champions. These leaders will guide your business through times of volatile change in the face of the unknown. This engaging course will fully train these champions and ready them to lead.